When properly designed, dashboards can provide a powerful means to rapidly monitor what's going on. 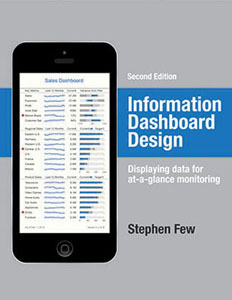 This book exposes the common problems in dashboard design and describes its best practices in great detail, with a multitude of examples. Dashboards have become a popular means to present critical information at a glance, yet few do so effectively. When designed well, dashboards engage the power of visual perception to communicate a dense collection of information efficiently and with exceptional clarity. However, the visual design skills that address the unique challenges of dashboards are not intuitive but must be learned. This book not only teaches how to design dashboards but also gives a deep understanding of the concepts—rooted in brain science—that explain the why behind the how.